An ottoman brings with it a variety of uses, none of which you'd want to compromise. Whether its purpose be a foot stool, regular stool, coffee table, or storage, you want to keep it in tip top shape so that it complements the rest of your outdoor pieces. Our Prestige ottoman covers will do just that, with the help of quality features you won't find elsewhere. For example, this material is constructed of a thick, 900-denier, solution-dyed woven polyester, making it our most colorfast fabric. 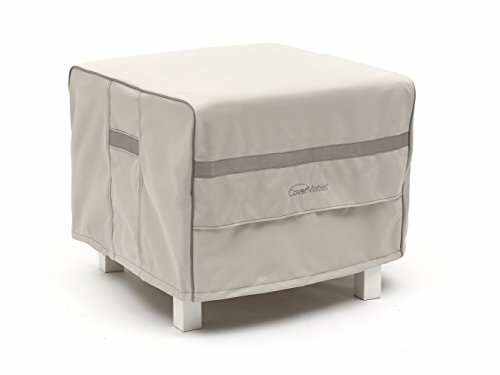 It also uses an eco-friendly, waterproof backing that plays nice with your ottoman's finish. This means no rubbing, color transfer, or melting. The most notable features of our Prestige covers include reinforced handles, webbing across the top of the front and back covered mesh vents, piping along the cover's silhouette, 2 drawcords, and 4 securing buckle straps for opposing legs.